Thoroughly updated, the second edition of Effective Maintenance Management provides clear rationale and comprehensive procedures for maintenance in industry. Author Vee Narayan has given us a unique guide, written in clear prose that practicing maintenance engineers, supervisors and managers can easily absorb, digest and apply. 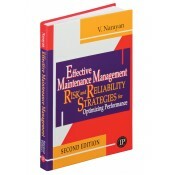 Effective Maintenance Management delivers 12 chapters in 300 pages in this hardcover volume. Narayan examines the role of maintenance as a methodology for minimizing risk related to safety and environmental concerns in industry. Also examined is adverse publicity from maintenance-preventable accidents, loss of profitability and maintenance-centric tools for risk reduction. The author employs specific situational descriptions to help readers select those tools as they fit the need. In industry, gaps can appear between industrial engineering for production, reliability and plant maintenance. Effective Maintenance Management works to bridge those gaps via effective management of the maintenance function. The result enables production-oriented businesses to maximize assets while achieving safety and profitability. • Includes chapter previews and summaries, a list of acronyms, and a glossary of terms.